January’s Druid Walk will be tomorrow, Sunday the 28th, in Fish Creek Park. We’ll meet at 10:30 at the Burnsmead parking lot. Follow Bow Bottom Trail into Fish Creek Park and take the first left after the houses. This lot is also located beside the Fish Creek Mountain Bike Skills Park. Please dress for the weather!! There will be a significant wind chill. Ice grippers are probably a good idea too! Blessings of the New Year to everyone! 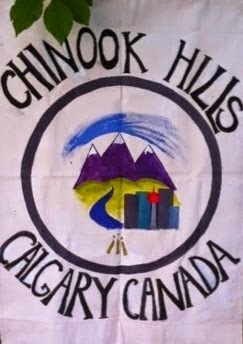 Chinook Hills Grove is continuing our monthly Druid Walk throughout 2018. Lists of dates and locations can be found here. Watch this space in the week leading up to the Walk for specific details! Our next Druid Walk is upon us TOMORROW! Lets meet on the wooden decking in front of the old firehall at 10:30 am . The address is: 1101 Memorial Dr. N.W. As always dress for the weather - and plan to stay afterwards for a tea/coffee nearby. October’s DruidWalk will be at Canmore Park, in NW Calgary. Meet at 10:30 am in the parking lot. The address given for the park is 2020 Chicoutimi Dr NW., however, the actual parking area is off 19th street and Chicoutimi Dr, please view it with the satellite view on Google maps. Please dress for the weather! Afterwards, we’ll head to Brentwood Village Mall for coffee and conversation. Our walks are open to the public. They are a great opportunity to meet us and ask questions in a casual environment. We do ask you to please email us at info@chinookhillsdruidry.org in advance, so we know to expect you. Here is a quick reminder! We meet at Chinook Rotary Nature Park at 10:30 am for our monthly Druid Walk.